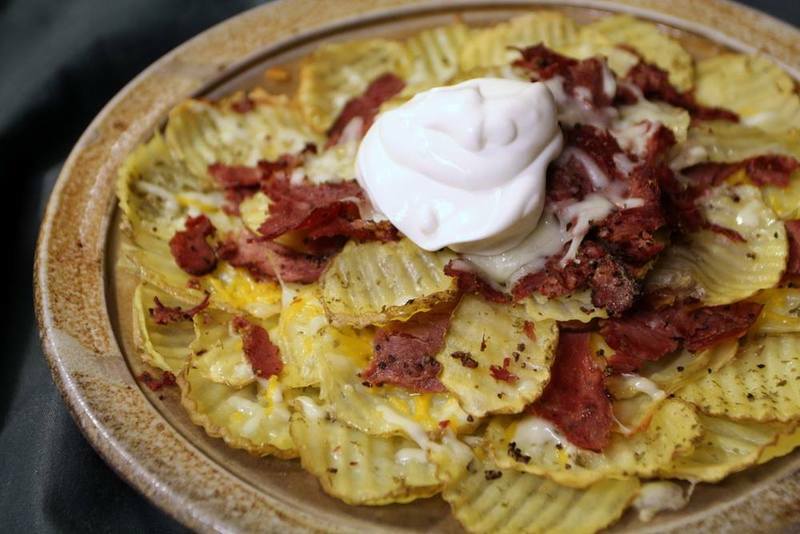 Special thanks to Kat Robinson of Tie Dye Travels for sharing her Irish Nachos recipe with us. These potato, cheese and pastrami bites are good for dinner but also make an excellent breakfast option. Pastrami is something a lot of us Southern folks don’t really seem to understand so well. We get corned beef, that salty deep pink meat perfect for our Reuben sandwiches. But pastrami has a different note and flavor. Both of these beef preparations came about thanks to the need to preserve meat before the age of refrigeration. While corned beef is cured with salt and then often boiled, pastrami is brined with salt and then partially dried to condense the flavor. Seasoned with black pepper and herbs, pastrami is then smoked and steamed, resulting in a taste that’s spicier and stronger. Oh, and while pastrami is usually made from beef, it can also be created from pork, duck or even goose. Now, here’s the fun part. The common thought these days is that corned beef is an Irish convention. Well, while a type of brined preparation of beef came about in Ireland, it was the English who gave it the name. Furthermore, the cost of corned beef in Ireland was somewhat prohibitive, while bacon was relatively cheap (and popular). It wasn’t until vast numbers of Irish folks immigrated to America that corned beef came to be a common dietary staple, since at the time beef was far more prevalent than pork. Pastrami’s roots actually go back to a dried beef preserved in Byzantine times. Its Romanian and Turkish development gave it the original name pastrama, and it was commonly made from goose. Romanian Jews brought the meat over to the States in the latter part of the 19th century – about the same time those Irish immigrants were making their way here. These new residents also discovered the cheapness of beef and made the switchover to creating pastrama from beef bellies… and it’s believed the American name of pastrami was born (it was also a way of making it sound similar to salami, which Americans already knew about). Today, we have Reuben sandwiches and pastrami sandwiches, and several places around Arkansas sell what’s called a New York or New Yorker sandwich that contains both corned beef and pastrami. Did you know that Petit Jean Meats makes a beef pastrami? Brined, dried, herbed, smoked and steamed, the Morrilton-based operation offers the sandwich-friendly meat through its website and a limited number of delis. It’s Petit Jean Meat’s version of the secret menu item, and it makes marvelous sandwiches. In Ireland, St. Patrick’s Day was a feast day in the church. It didn’t become celebrated secularly until 1903. Here in the States, we’ve been celebrating Irish American heritage since the latter part of the 19th century with food and good company. For many, that means pub food along the lines of green beer and nachos. 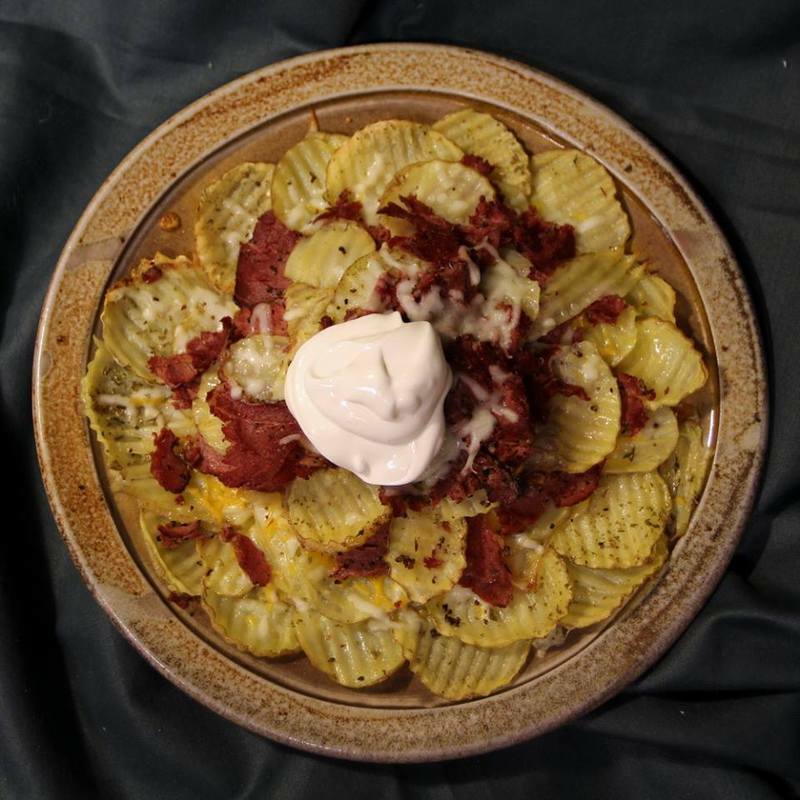 Well, here’s a nacho recipe utilizing Petit Jean Meats pastrami that will put some Arkansas in your Irish. 1.) Heat oven to 350 degrees. Oil a large sheet pan. 2.) Slice potatoes on a mandolin or similar contraption to ⅛th inch thick rounds (you can either do straight or crinkle cuts). 3.) Toss potato slices with olive oil, salt and herbs. 4.) Lay out in single layer on sheet pan and bake in oven for 12-15 minutes or until the edges start to get crisp. 6.) On a ceramic oven-safe serving dish or in a cast-iron pan, lay out a layer of potato slices. 7.) Lightly cover with pastrami shreds and a sprinkling of each cheese. 8.) Repeat with remaining potato slices, pastrami and cheese. 9.) Bake for 5-7 more minutes in the oven, or until the cheese melts. 10.) Serve with sour cream.